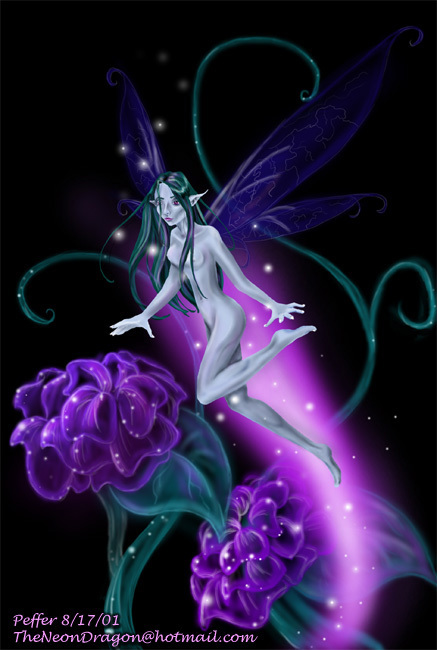 Fairies are little beings that live on the Astral Plane. They can come over, between planes, but it is much easier to contact them through the Astral Plane. Meditation is one way to contact the fairies. To do this, you should go to a place where you can relax with out any disturbance. Take the phone off the hook and, if necessary, lock the door. Get into a comfortable position, preferably sitting, because, when you lay down, you may fall asleep. Close your eyes and breath in and out slowly. Imagine your body relaxing, starting at your toes and going to your head. Spend extra time on your back, arms, and neck, as they build up a lot of tension. You could picture yourself walking down stairs, each step relaxing you. Once you're relaxed, picture yourself in a meadow or garden. Forests and rivers are also fine. 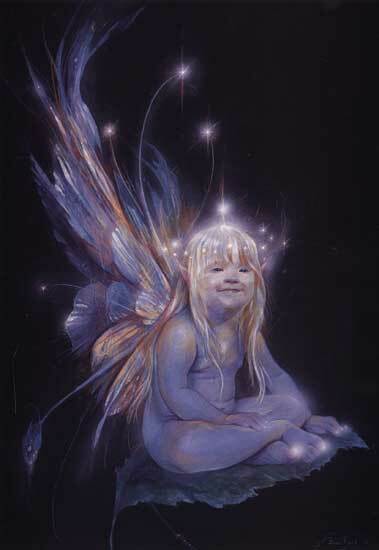 Ask for the fairies to show themselves and tell them that you mean no harm and only want to learn and talk. This may take time. Once the fairies trust you, they'll come out. Always be careful when contacting fairies and carry a charm of protection with you. You don't want to bump into a violent fairy when you have nothing to protect you. Not all fairies are the cute little pixies we picture flitting around. While meditating, picture the garden or valley as best you can. See and smell everything around you. Walk around and try to find the fairy trail, the dark green line running through the grass. Once you find this, follow it, in any direction. Along the way, look about you. Think that you would like to contact the kind fairies and tell them that you are not meaning any harm and are only here for some contact. Once you find a place which you think is fine, sit down on a rock or stump, and talk to the fairies. Show them that you have only good intentions and ask only for the good fairies. They should come, if they believe you. Sit where the cat sits. Cross your toes. Close your eyes. And smell a rose. "I believe in fairies, sure as death." From "Lady Cottington's Pressed Fairy Book"
If you want to attract fairies to your home you should leave some food offerings. This will give the fairies something they want and it leads them to trust you. Try leaving small cakes, candies, ginger, barely, icing candies (like for birthday cakes), etc. They also love gardens, so you leave some of these offerings there, in a bowl or basket. Planting roses, bluebells, thyme, etc. will also help attract them to you. Don't look for the offering to disappear because the fairies don't physically eat them. 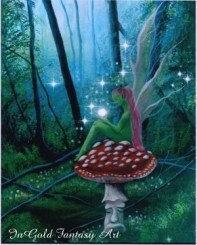 Fairies are capable of taking the energy from the offerings, rather than taking the offering itself. In a few days, the cake may still be there, but it may look a bit plastic or unreal. Of course, if an animal comes along and eats the offering, this is a good sign. Don't send it away. It may be the fairy in animal form coming for its present. Fairy Garden- You can plant a garden for the fairies. This is a wonderful idea. You can think about planting bluebells and roses in the garden, since fairies love them. Also, fairies and animals alike love water. You can create a wonderful pool in the middle of your garden. Just dig a small hole and line it. Place rocks around the edge. You can replenish the water each time you water your garden. Fairies also like the wild. Let a small portion of your garden overgrow an get tangled, without weeding it. This will be the place for those wild Faeries. Fairy Altar- You can set aside a table top, corner, dresser top, etc. for a fairies Altar. On this altar you can place your offerings in a basket. Also, you could have flowers and statues. Dirt and water are also good. Make it pretty, but home-like as well. A rose oil burner can be great too. Fairy Bubbles- Buy one of those cheap bubble bottles (for kids) and sit in your garden. Ask the fairies to join you and just blow bubbles. Watch the bubbles and relax. Don't just blow them all out for the heck of it. Smile and have fun doing it. Don't be nervous because 1) there is no reason to be and 2) the fairies may sense it. 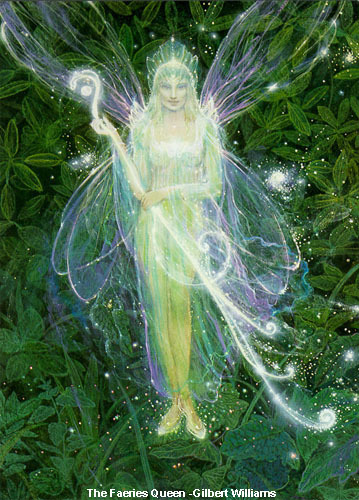 Fairies can be very helpful in magick, as they have a lot of power and they are certainly not ignorant when it comes to using it. Fairies know a great deal of magick and glamour themselves, so, if you can get them to trust you, they can be a great help. 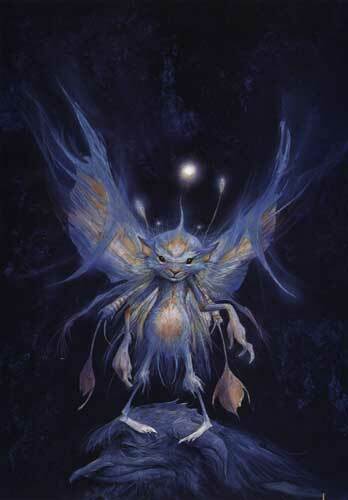 Fairies, with the except of a small few, hate love spells and will not be able to help you with them. Love isn't a big thing on the Astral Plane, so they really don't understand it and can't work for it. Selfish spells, for only self improvement, are not good spells to ask for help with either. Fairies will gladly help, when asked correctly and well thanked by offerings, with spells that benefit others and nature. Fairies are not content to simply stand on the outside of your circle and watch. Get them involved. 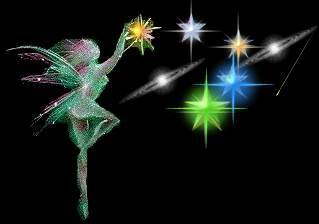 Singing, chanting, and music are great for involving the fairies, along with enhancing your spells. Get them interested. If you're singing and dancing, they'll want to come to you. Thank the fairies when you're done, but give them an offering too. They prefer food and trinkets to a simple little "thanks". If you walk nine times around a fairy rath at the full of the moon you will find the entrance to the Sifra; but if you enter beware of eating fairy food or drinking fairy wine. If you need a neat tool for your desktop to help you tell when it is a full moon click here to download. In Connaught, the people have many strange superstitions of great antiquity. If a child spills its tin of milk on the ground, the mother says: "That is to the fairies, leave it to them and welcome" and the child is never scolded, lest that might bring ill luck. For the fairies hate everything that is mean being of themselves of a bright, free, joyous nature; except, indeed the Banshee, who is the spirit of sorrow and doom. The fairies like people who are kind and considerate, and who leave food on the dresser and fire in the grate at night for when they hold their councils; yet not too much fire, for they dislike smoke, and the good woman of the house must never throw out water after dark, without saying: "Take care of the water", for the fairies are very nice in their ways, and resent any such chance as might spoil their pretty gay caps and feathers. They greatly desire human aid and are very clever and acute in obtaining it. Rose- Fairies love roses for their smell and beauty. If you would like to make fairies welcome, plant roses in your garden and burn rose oil. Bluebell- Bluebells are loved by the fairies as well. Fairies often use the flowers to adorn their horses. Don't pick bluebells or step on them. A field of bluebells may have much Faery enchantment. If you hear the ringing of the bluebell, you or someone close to you will soon die. Willow- The Willow is a tree with a distinct personality. It can be heard weeping at night, but, more commonly, it uproots and follows lone travelers at night. Elder- The Elder is a sacred tree to the fairies, along with the Ash, Holly, and Oak. Don't put your baby in a elder wood cradle because bad Faeries may pinch it, although most fairies love children. Alder- Some say that this tree protects against water spirits. Oak- Look for Oak groves, as fairies tend to love Oak. Oakmen come from felled Oak stumps. Ash- This is a lovely tree that is often used for wands. It has healing qualities. Thyme- If you use Thyme in a potion you may be able to break the fairies glamour, which they use to make things invisible and appear as something else (for example, gold is really grass in the Faery world). Cowslips- This is used by the Faeries to find gold. It is protected. Toadstools- People of old used mushrooms as drugs, like LSDs, to get visions and trips. These are often poisonous. Don't eat!! Faery Ring Mushrooms- Fairies dance all night long and, in the morning, rings of mushrooms may be seen. They are the boundaries of the dancing circle. Be careful not to step inside the circle, as you may enter the Fairy Realm and you'll be stuck there. Apple- This is used to ensure good harvests. If milk is spilled, you should not worry about it. Just think that it is an offering for the fairies. This connects with the saying "Don't cry over spilled milk". Leave food out for the fairies. A fairy ring, also known as fairy circle, elf circle or pixie ring, is a naturally occurring ring or arc of mushrooms. The rings may grow over ten meters in diameter and become stable over time as the fungus grows and seeks food underground. They are found mainly in forested areas, but also appear in grasslands or rangelands. Fairy rings are not only detectable by sporocarps in rings or arcs, but also by a necrotic zone (death grass) or a ring of dark green grass. If these manifestations are visible a fairy fungus mycelium is likely present in the ring or arc underneath. Fairy rings are rings of mushrooms surrounding the area where the fairies dance at night. If you are near a ring when the fairies are dancing, you'll be drawn to it. If you enter, you will dance with the fairies, unable to stop. It may feel like only minutes, but it is, in reality, years, around 7. The only way to get out is if someone comes after you and pulls you out, while keeping their foot outside of the circle. 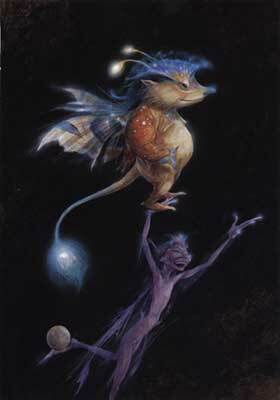 Faerie kin can be divided into numerous classes, or races. 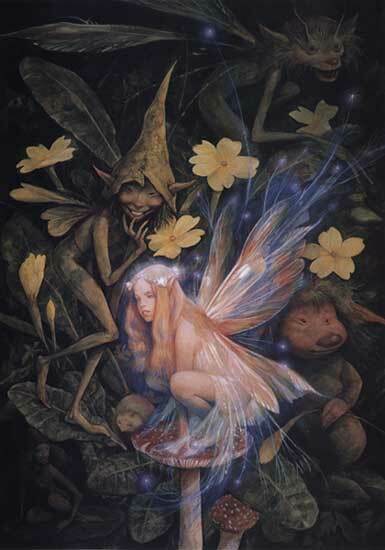 Fairie is a collective term for many different beings, usually possessing magical powers. Many fairies have a human form, but some have animal or human/animal shapes. Who they are and how many there is, is something that varies among the facts I've found. So I give you all the classes I've found, and you can decide for yourself who you think are fay and who're not. The fay is mainly used to signify enchanters and enchantresses with supernatural powers. Some fay are mortal, others are supernatural beings or are part human and part supernatural. Two well-known fays are the Lady of the Lake and Morgan le Fay. 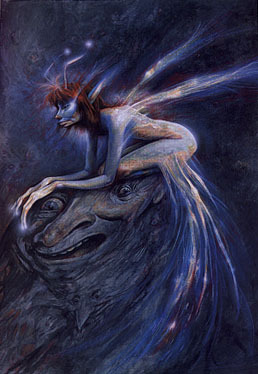 Certain monsters and demons having a connection with fairies and/or having some of the characteristics of fairies. The nature fairies are mermaids, water-spirits, tree-spirits and such. This may be considered "true" fairies. Two main groups: The communal fairies, who belong to a group, tribe, and/or nation and live together, or the individual or solitary fairies, who are usually associated with a place, occupation, or household. For the most part communal fairies live in a Fairie land and may have a loosely organized social structure, or a distinct structure with a king and/or queen. The solitary fairies are of two general types. Some have a connection with humans, others avoid them. The hobgoblins are friendly spirits who live in houses and do domestic chores, such as helping bread to rise and caring for unattended babies. The brownie is another type of solitary Fairie. The banshee is a solitary Fairie who wails to foretell the death of a family member. The leprechaun is a solitary Fairie who shuns human contact. Gnomes are earthly creatures, guardians of sacred places or things. Their weakness is sparkly things like precious stones. They make beautiful things out of stones and gems. Sprites are playful nature spirits that live in ponds, trees or other cool places. They often play with nymphs and butterflies and were charged with changing the color of the leaves in autumn. They are muses to artists and poets and can bond to humans or elves, in which case they stay for the rest of their lives. Elves are carefree nature spirits who dance and play stringed instruments. They live underground in in springs...sometime seven in air...They aren’t bad, but sometimes their pranks have been fatal to humans, but never intentionally. Elves apparently came in several distinct varieties. Though they were a rather mournful lot, one breed of elves was an invisible kitchen helper for good servants, the other the bringer of illness and misery. They can be of both sexes, or sexless. They can have wings, often do, and are no more than 30 cm high. Originally a part of Scandinavian mythology. The good elves lived in the air and the trees, and the evil ones underground. Dwarfs are often thought of as strictly male, but some taletellers tell of female dwarfs...but who can tell?? Their beard is as thick as a male’s!! (ok.. some say they don’t have beards! Not even the males!!) They live for mining gold and silver and live in groups. They are masters at metalworking. Jinn (Arabian). Spirits with shape shifting ability. They're normally transparent, composed of flame or vapor. Some are good, while others are evil. If they take human shape, they are generally handsome if good, and horribly hideous if evil. They may also be of an enormous size and can make themselves invisible This means they cam disappear into earth, air, or through solid objects. They usually live in deserted buildings, water cisterns and wells, rivers, crossroads and markets. Ghoul, that haunt burial grounds and feeds upon dead human bodies is thought to be an inferior order of the jinn. Mermaids are water-dwelling females with long-hair. Woman to the waist and a fish tail below. some say legs or two tails) She is musical. Often sings or plays the harp. They normally inhabits the sea, but may also be found in lakes, rivers, wells and other watery places. They have been known to warn of storms or other future events, and if one is seized, she can be forced to doso, or to perform other tasks. Mermaids may sometimes adopt land-dwelling children, making them their protector. Mermaids may also marry a land-dweller, or draw men to under the sea with them, either allowing them to live-in bliss or to be drowned, depending on her whim. Nixes are similar to mermaids, but are able to assume totally human form, but they always retain some mark of being non-human. Goblins are pranksters, and are known to rearrange items in the house or tangle horses’ manes. On one page I found the beautiful analysis "As we near the 21st century, it seems obligatory to seethe goblins as representing the conflicts we all have within ourselves- most as ugly and mischievous as the goblins were known to be." Pixies are neat creatures.. They aern't evil, but perform quite unkind tricks, like leading travelers astray or to steal naughty children. They like to pinch maids who don't keep the house clean. They were often thought to be the souls of babies who had died before baptism. Trolls. Nowadays, we often think of trolls as big, clumsy creatures who go around hitting people on the head with a hammer or something, but in the Middle Ages they were thought to have magical powers as fortune-telling. Asrai are small, delicate water faeries. Fishermen might catch Asrai with his catch. When exposed to air they melt, leaving nothing more than water behind. Brownies come out at night to finish work that's been left unfinished. They are devoted to their household and expect nothing but a bowl of cream and a cake for their concern. Any offer of reward or clothing will drive the brownie away. Boggarts are "evil" brownies, they've often have been wronged by humans. They like tricking humans and often cause a great deal of trouble. Changelings are fairies taking the place of a human child who has been stolen by other faeries. (in some stories like Scandinavian ones, changelings are Troll children) Parents may recover their own child if they can trick the changeling into revealing it's age. Selkies are faeries who put on seal skins and appear to be seals as they travel in the water. On land they shed their seal skins and have human form. A selkie maiden can be won as brides by stealing their seal skin as it lay on the beach, so they couldn't return home. Fairies can also be divided into the Seelie court and the Unseelie court. The unseelie Court comprise the Sluagh, or the Host. They are the unsanctified dead who fly above the earth, stealing mortals and take great pleasure in harming humans. The Seelie court, or the blessed court, is friendly towards humans. The Seelie Court and the Unseelie Court are often at war, and humans may get caught in the middle of such battles.